Are you surprised to hear from me so soon? I know, I have been posting up a storm the last few days, but today I have an exciting announcement: Rochelle from Lucky Lucille, Sarah from Rhinestones and Telephones, and I are doing another sew-along! 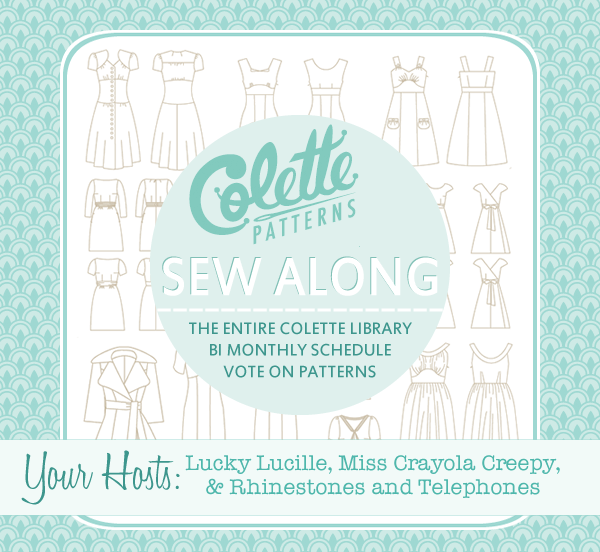 This one is going to be a bigger one, we're sewing through the Colette Patterns library. I know, at first it sounds like a lot to take on, but since it's bi monthly it will be a lot easier to fit into everyone's schedules. Plus, you can pick and choose which patterns you would like to sew along with. The first pattern will be the recently released Hazel dress, but future patterns will be decided by you. 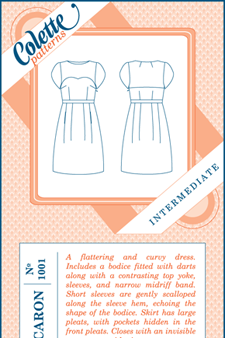 Participants will vote on which patterns they would like to sew. The pattern with the most votes will be the next project. I hope that you will join us in one, some, or all of the patterns. 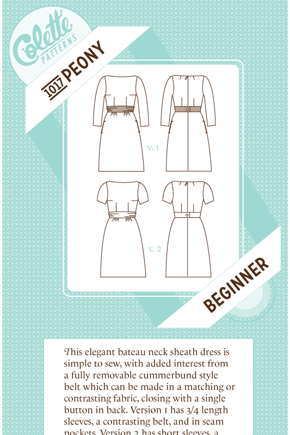 This sew-along is not just for experienced sewers. Remember, at the start of the last sew-along (Sew Colette) I had only sewn a handful of patterns. 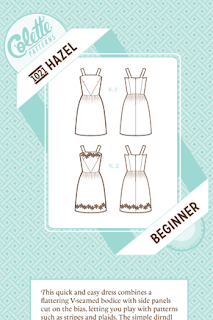 With the help of others in the online sewing community and using the Colette Sewing Handbook as a reference I was able to learn so much. I hope that you will consider joining us! Thank you to Rochelle for making these buttons. Feel free to take one and add it to your blog. Week of August 1st: Muslins! Week of August 12th: Fabric, Fabric, Fabric! 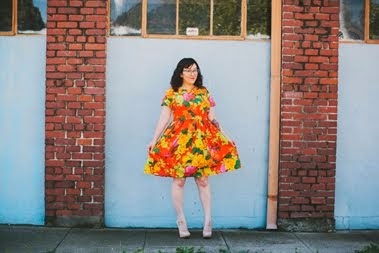 Week of August 19th: Sewing Macaron and Guest Bloggers! Week of August 26th: More Guest Bloggers! Aaaaaah, there's more! This is so exciting! Upon reflection, this is perfect, too--I was initially sort of thinking, "gosh, I'll have to hop in and out again because I don't necessarily love all the patterns," and then I realised: if there's one I'm not so into, I can substitute by catching up on the handbook patterns I missed during v1.0! GREAT. DEAL. I'm so glad you are going to sew along! Are you going to do the Hazel? !!! So happy you are sewing along!!! I have my eye on Lily, so I'm totally voting for Lily. Time for me to get my sew along on!! I'm glad to see the fun never ends. Yay!!! Maybe we can get together and work on this one together? I'll even come up north if you want! Yippee!! Cannot wait to get started! Ooh. This looks fun. I needed some inspiration to help prevent a case of the End of Me Made May Blues. Hazel is adorable. I'm in! I just made a Hazel, but it has been too cold to wear it! I would love to make another one with you!